Washington, D.C. – Idaho Congressman Mike Simpson met with Congressional Art Contest Winner, Bailey Annis from Bonneville High School. Annis took first place in Idaho’s second congressional district’s art contest. The Congressional Art Competition began in 1982 and more than 650,000 high school students have participated. Southwest Airline donated airline tickets for Bailey to attend the Congressional Art Reception in Washington D.C. that was held this week. 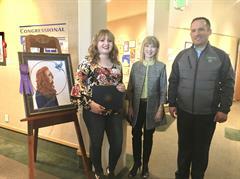 The Art Museum of Eastern Idaho commissioned a panel to jury all submissions and then all entries were on exhibit in March, where over 1,200 people viewed the artwork from Idaho high school students. The winning piece from Bailey Annis is now on display with the winners of every other congressional district in the country for thousands to see in the U.S. Capitol.